Tresu Group will present its ancillary program of automatic ink supply and chamber doctor blade systems for flexographic label and packaging presses at Labelexpo India 2018. One of the highlights will be the new Tresu FlexiPrint Reservoir SAVEink chamber doctor blade for narrow web flexo applications up to 800mm wide. With an integrated high-capacity reservoir, the SAVEink chamber doctor blade is meant for process and spot colors as well as high ink transfer printing, without the need for a connected pump. It is suitable for long and short run production; ink may be added to the reservoir without stopping the press. The Tresu SAVEink chamber is sealed and locks into place in seconds without the risk of spilling or ink contamination. Its doctor blades are in fixed, pre-set positions and require no further adjustment: optimal contact is made with the anilox roll, minimising wear. Visitors to Labelexpo India 2018 will also experience the Tresu SAVEink chamber doctor blade installed on a press at the Alliance Printech stand. Tresu’s chamber program is available for all web widths from 185mm to 6000mm and includes lightweight, corrosion-resistant carbon fibre and ceramic variants. Using the company’s pressure control technology, the chambers eliminate air contamination and microfoaming, to ensure clean, uniform print on the substrate. Suitable applications include labels, flexible packaging, and paperboard printing and coating. Chamber blades may be supplied with new presses and retrofitted on existing ones. Also featured on the stand are other doctor blade models in the FlexiPrint range: FlexiPrint Basic and FlexiPrint Reservoir, offering high price-performance ratios. FlexiPrint Reservoir is designed for water-based and UV coatings. It can be manually filled or used with a pump. 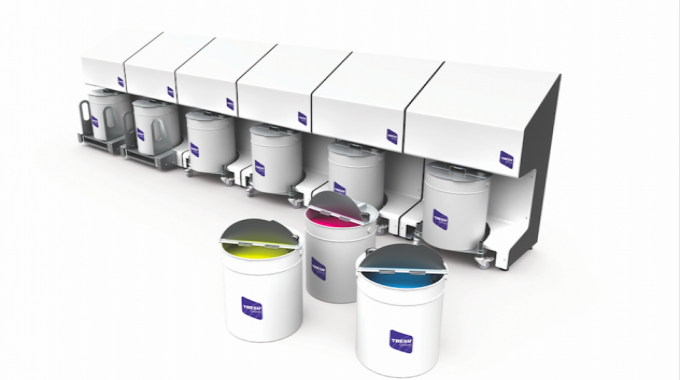 The easy-load cassette enables fast colour/coating changes and the patented seals mean that surplus ink can be reserved in the chamber for future use. In addition, information will be available for the carbon fibre MaxiPrint Concept chamber for web widths from 1600mm to 6000mm, full range of Tresu coating circulation and conditioners for high viscosity inks, and on Tresu Flexo Innovator flexo printing machine.